Lauderee tea room, situated on the ground floor of the world famous Harrods Department store is a French cafe and restaurant offering delightful culinary goodies in a refined atmosphere. 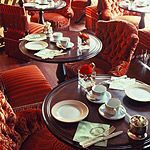 Do you work at Laduree Tea Room? What did you think of Laduree Tea Room? I'm just a little bit of a cake junkie so Laduree has become one of my favourite places in London since it's recent opening. I like that Laduree has a separate entrance so you don't feel like you're in Harrods.